How to find and delete Stalkerware and Spyware from your Smartphone? We have been reading a lot about computer viruses, malware, and other threats. And now out there is a new menace called Stalkerware. An invasive program installed by your family or friends to spy on you. 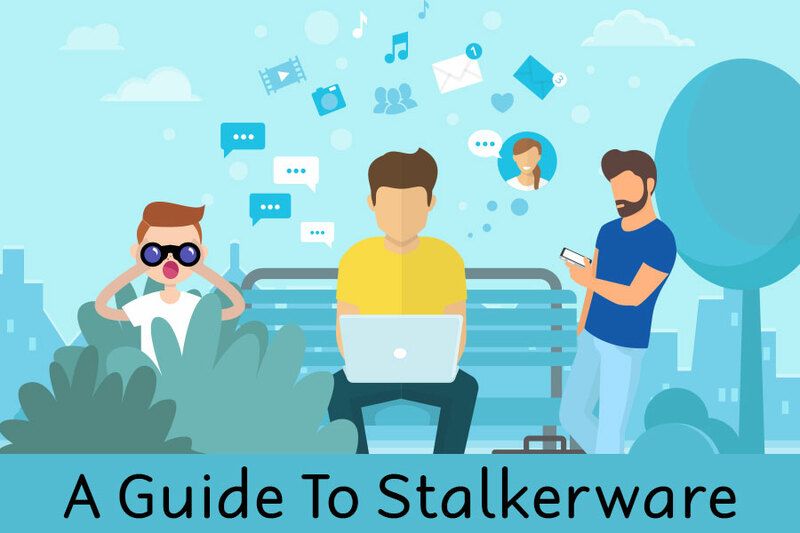 So if this makes you feel a little uneasy, we have a detailed explanation about Stalkerware, its warning signs and what you can do about a Stalkerware. The term Stalkerware has been around since 1996, but recently it has gained popularity. Stalkerware refers to invasive applications installed on your smartphone and computers. These applications enable the installer to spy on your online activities without your knowledge. In nutshell we can say, it is an advanced form of spying. Parent spying on their child is the mildest form of Stalkerware. While the creepiest form of it is when an employer uses it to track everything you do, or spouses use it to keep a check on their partner. Stalkerware is designed to run secretively in the background and collect a slew of personal data. SpyPhone: The app that supports both Android and iOS is the next generation smartphone surveillance application. Using it one can record incoming and outgoing phone calls, SMS, pictures, and surroundings. It offers full control over the victim’s device functions. Moreover, using SpyPhone you can check messages from an application like WhatsApp, Viber, Facebook, Instagram, Line, track GPS location, browser activity and much more. FlexiSpy: Another app compatible with both Android and iOS platform. FlexiSpy is world’s #1 monitoring software, using it you can easily monitor your employees or kids, track SMS, MMS, monitor calls, web and social media, GPS, Photo and video monitoring. FlexiSpy’s slogan: “It takes complete control of the device, letting you know everything, no matter where you are,” says all about the application. This application works in Stealth mode, compatible with non-jailbroken iOS, live control panel, monitor up to 5 devices and 24*7 supports. mSpy: One more Stalkerware app compatible with both Android and iOS is a powerful tool for parental control. The app can track all activities including call history, GPS location, messages, WhatsApp, Snapchat, social media and much more. Moreover, it includes a keylogger to record every keystroke made. PhoneSpector: A smartphone tracker designed for both Android and iOS devices, works undetectable remote access.” The software does not require jailbreaking, it can be used without any access to the target device. To use the application all that is to be done is login to the target phone and start the installation. Once done install the software and start extracting data. All this data can be viewed from anywhere by logging into your personal user dashboard. Besides the above-explained software Android Spy, Spyera, Mobistealth, SpyBubble, are a few more examples of Stalkerware. In addition to this always remember you can be tracked by an authentic software. How Stalkerware gets Installed on the Device? Stalkerware does not need to find a way to intrude, because most of the time it installed on the victim’s device physically by some family member, wife or friend. In addition to this, there are remote options too using which Stalkerware can be installed as they don to need physical access. If you start receiving strange or odd text messages, social media messages, or emails, then consider this as a warning sign and delete such messages without downloading any files or clicking on any links. There’s no magic button to send spyware but sometimes accidental installation of spyware may make you a victim. If you find your device missing and then reappearing with changed settings that you haven’t made, consider it as an indicator of compromise. How to know when you are being Monitored? Detecting Stalkerware isn’t easy as they are becoming more sophisticated. But it isn’t the case with all forms of Stalkerware. Sometimes by keeping a check on your phone activity and checking the installed apps, you can know if you are being monitored. Android: Always check your phone settings, if you see a setting that allows the application to be downloaded and installed on your device. Consider this as a sign of tampering without your consent. The setting is found under: Settings – > Security – > allow unknown sources. (However, it may vary depending upon your device.) Plus, you can check the list of installed software, however, if the Stalkerware runs in stealth mode then you may not be able to find it in the list. iOS: Unlike Android, it is difficult to install unknown applications on iOS devices, unless jailbroken. However, if you find an application called Cydia, on your iPhone then consider your device is compromised. Cydia is a package manager that allows users to install software packages on a jailbroken device. Mac: On Mac, machines click “Launchpad,” “Other,” and “Activity Monitor” to check the status of running programs. To reach to Activity Monitor you can even use Spotlight. Windows: Check the list of installed programs, if you see an unknown application then uninstall it. Also, you can check running processes under “Task Manager” to find suspicious programs. Another way to know if Stalkerware is installed is antivirus scan. In certain cases, you may also notice the device’s strange behavior, experience unanticipated battery drains. If that is the case consider it as a sign of, Stalkerware. Most importantly trust your instincts. If you suspect something is wrong, then it is you should take control of the situation and take the right action. How to remove Stalkerware from Your Device? This is when things get difficult as Stalkerware run in stealth mode, which makes detecting them impossible. This means removing them isn’t possible but if we take certain drastic steps then Stalkerware can be removed. When a Stalkerware is removed operators receive alert warning informing them about the victim’s device being cleaned. Also, if you stop receiving information then consider it as malicious software being eradicated. – Run a virus scan: On both PC and smartphone antivirus software should be installed and run to detect and remove spyware, and other infection. This is the best and simplest solution to avoid and detect spyware, Stalkerware in all cases. – Enable two-factor authentication: If you are doubtful and think your account is compromised change passwords for all accounts. Most of us have two accounts as one is used to recover password so change that too. In addition to this, enable 2FA so that you get to know if someone else is trying to login into your accounts. 2FA adds an additional layer of security and help protect individual accounts. –Update your OS: This may sound obvious but still, most of us fail to update the OS. When an operating system update is available one should always update the OS as this update as security patched and upgrades that protect you from Stalkerware. –Protect your device: Always use a PIN code, or pattern to protect your device. However, if you find it difficult then try using biometrics to protect your smartphone from future altering. Must Read : How Malware Attacks and Spreads in your Computer? How to Remove Different Stalkerware Applications? Above we discussed common Stalkerware application used by family members, friends to spy on you. Here we explain to you how to remove these applications. –FlexiSpy: Usually, FlexiSpy on Android devices pretense under the name “SyncManager.” If you see such an app on your phone, uninstall it with immediate effect and restart your phone. It can also masquerade under another generic name, therefore before you delete any app search its name first. –mSpy: To remove mSpy, the iPhone, open Cydia, and search for “Installed” applications. Here look for “IphoneInternalService,” and tap modify to remove. If everything else fails and you still suspect, that you are being watched the last thing you need to do is factory reset the device. Performing factory reset will make your device as new but will also remove all traces of Stalkerware. Note: Before doing factory reset make sure you have backed up important data. Regrettably, sometimes factory reset also does not work as some sophisticated Stalkerware services claim to live factory resets. We hope you found the information useful and will keep a check on your device activity. We all know following without consent is unethical, yet our own family members and friends do such a thing just to keep a tab on things. Therefore, it is important to understand Stalkerware and how it can take place. We all have heard the saying, Ignorance is bliss but, in this case, it isn’t. It is a breach of privacy, therefore, if you want to stay protected and keep your privacy intact you need to cautious. By being ignorant you can be a victim of Stalkerware. Now, it is up to you what you want!